As the world’s largest pure-play fire protection and security company, Tyco provides more than three million customers around the globe with the latest fire protection and security products and services. 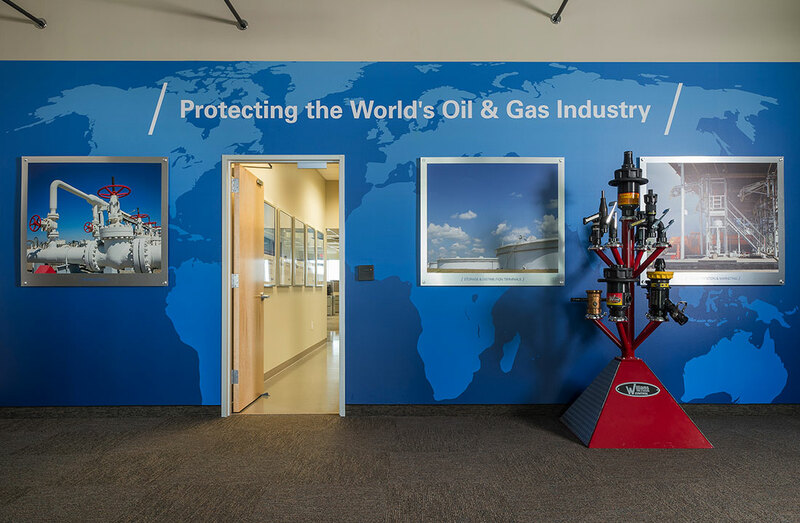 Protecting 90% of the world’s top 50 oil and gas companies with the latest fire protection and security solutions, Tyco’s corporate mission, vision and values are undeniably crystal clear. It was with this laser-sharp focus that Tyco challenged 2020 Exhibits to not only celebrate their vision and values but to create and execute a world-class environment in their brand new 70,000-square-foot state-of-the-art operational facility designed for their renowned Williams Fire & Hazard Control (WF&HC) team in Port Arthur, Texas. 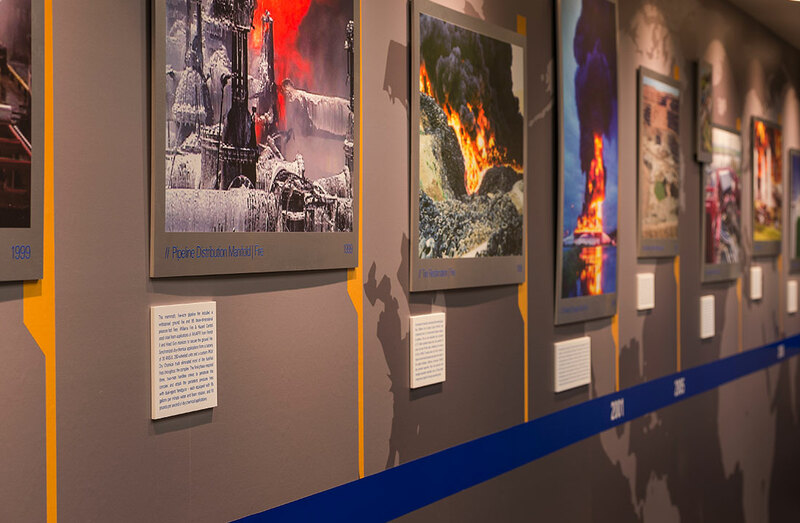 2020 Exhibits focused on infusing the space with the brand’s mission, vision and values in such a way that Tyco employees and guests would unquestionably feel and experience the Tyco brand from every angle and at every turn. 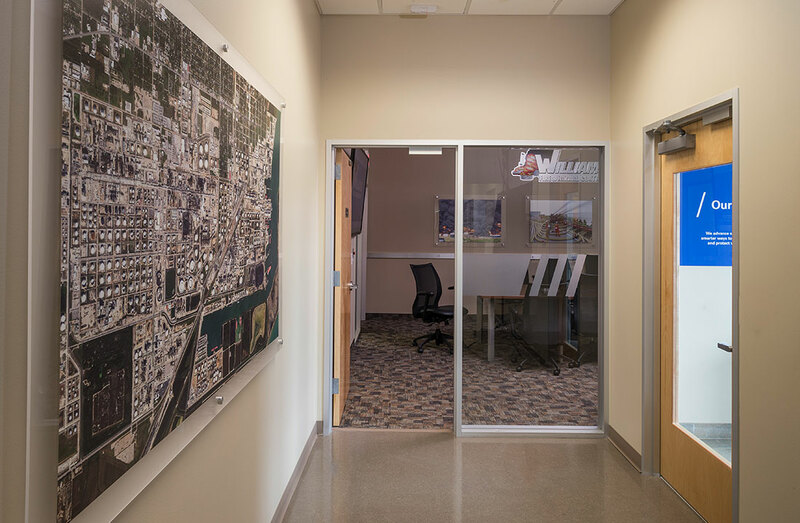 Equally important the space, branding and imagery flows well aesthetically across three distinct but collaborative and aligned areas, which include the employee work space; the state-of-the art, high-tech training classroom and the manufacturing plant. Blending the legacy that the WF&HC team continues to build along with Tyco’s leadership position in research, product development, educational services and emergency response, this world-class training center showcases a compelling mix of brand elements reflective of the Tyco mission, value and promise. Throughout the space and across key touch points, 2020 Exhibits incorporated elements reflective of the Tyco brand, including Vital Values, and the deliberate use of Tyco’s signature blue color and the Tyco blue stripe, found in the training room and throughout the facility. Design and messaging are clean and modern with the consistent integration of the brand promise and elements, including the Tyco Promise and the Tyco Purpose, along with Tyco’s signature Focus Bands – signifying the importance and responsibility of each word and image. 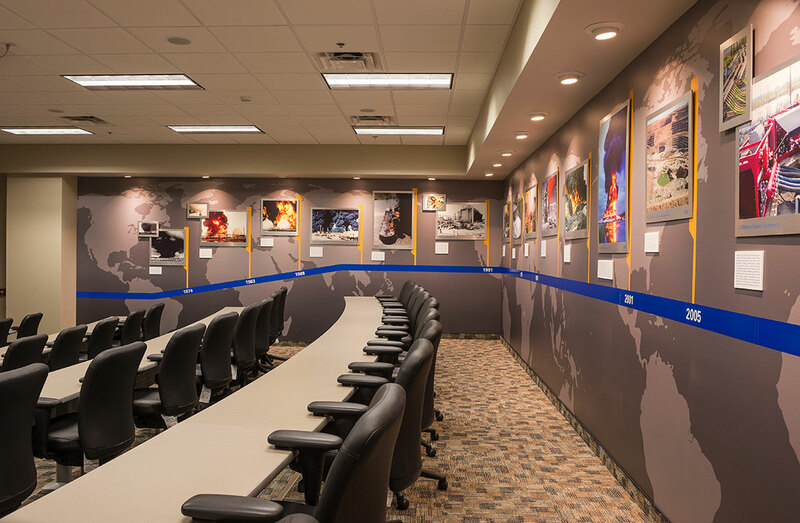 The state-of-the-art Training Room taps into a wealth of historic imagery and photos to deliver a strong, impactful History Wall that shares the story of all major incidents, as evidence of the brand in action. As a multipurpose environment, this space is used training for first responders from across the nation as well as for internal training activities. Dignified but engaging, the history wall is central to many of the ongoing client, outside visitors and employees conversations. 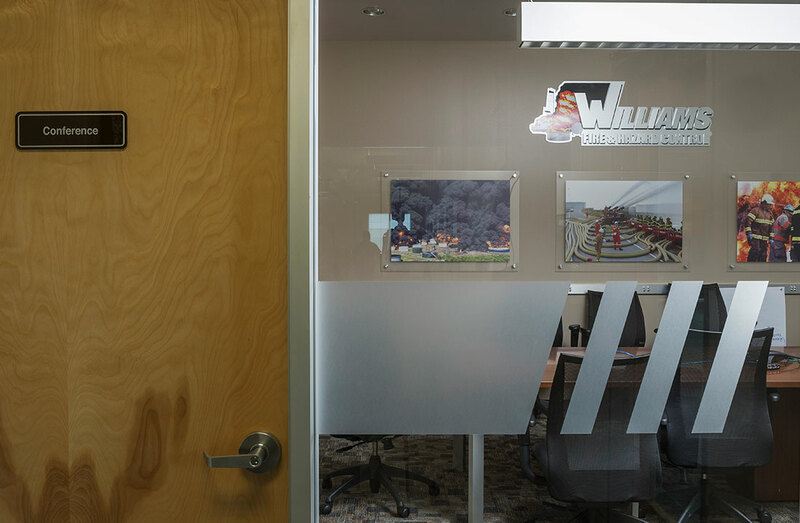 The Main Conference Room is used for project planning and brainstorming as well as outside client meetings. Two landmark patents are showcased and visible throughout. 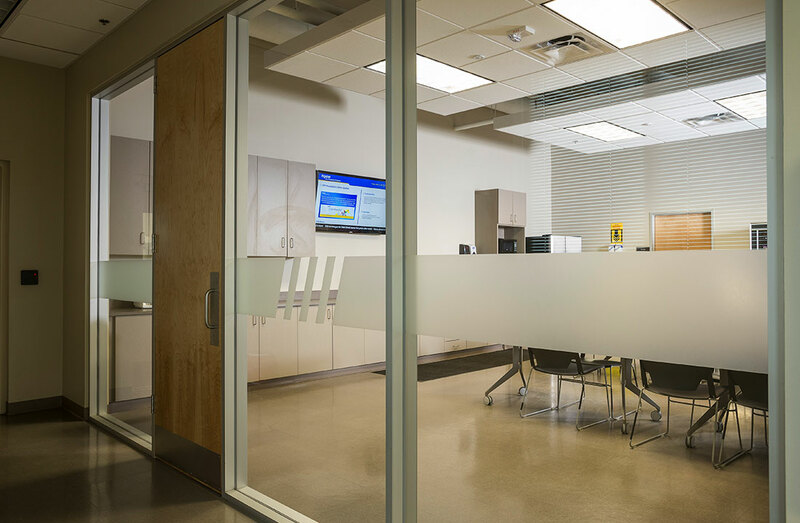 To maintain privacy yet a feeling of openness, the glass walls are branded with the Tyco color stripe along with the emblematic Tyco Focus Bars, serving as emphasis and a subtle yet strong brand element. With deliberate and exacting focus, these key branding elements and messages are also carried throughout the employee work space. The overall feeling is professional and inviting. 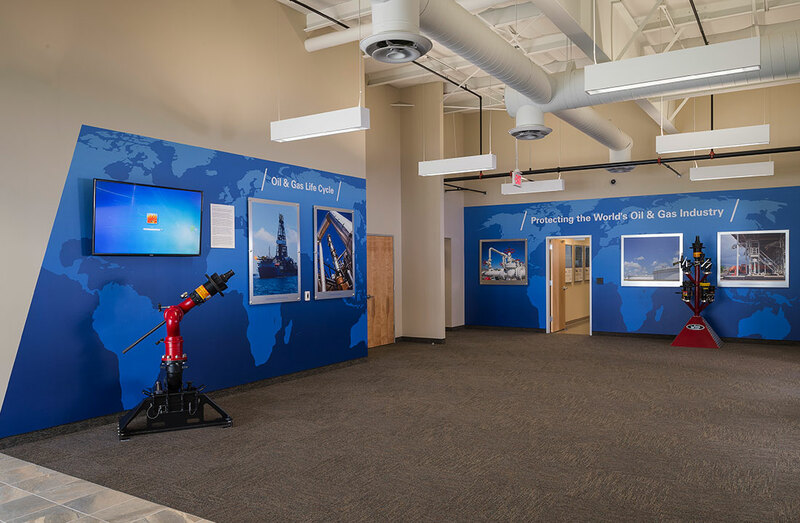 Engaging all the senses and reinforcing the brand’s passion, vision and values, the Port Arthur facility is seen as the model and best practice for Tyco’s worldwide corporate interiors and centers for excellence moving forward.